Kenny’s Deck is capable of more explosive plays, but Barwicki’s Deck is built on consistency. We’re about to find out which Deck will prevail. It’s time to Duel! Kenny won the die roll and chose to go first. He opened up with Danger!? Tsuchinoko?, The Ascended of Thunder, Neo Space Connector, Trickstar Corobane, and Ghost Ogre & Snow Rabbit. He Special Summoned Corobane from his hand and then Normal Summoned Neo Space Connector. He used its effect to Special Summon Neo-Spacian Aqua Dolphin from his Deck. He used Aqua Dolphin’s effect by discarding Ghost Ogre and revealed Altergeist Multifaker, Pot of Duality, Pot of Extravagance, Rivalry of Warlords, and Imperial Order from Barwicki’s hand. He sent Multifaker to the Graveyard and dealt 500 points of damage to Barwicki. Kenny Link Summoned Knightmare Cerberus and then used it as a Link Material to Link Summon Knightmare Mermaid. He discarded Tsuchinoko to use his Mermaid’s effect and Special Summoned Orcust Knightmare from his Deck. He combined his Mermaid with Orcust Knightmare to Link Summon Galatea, the Orcust Automaton. He then used Orcust Knightmare’s effect by banishing it from the Graveyard, and then banished Orcust Harp Horror from his Graveyard to Special Summon Orcust Cymbal Skeleton from his Deck. He Link Summoned Summon Sorceress next, and after a flurry of plays, he ended his turn with Summon Sorceress, The Phantom Knights of Rusty Bardiche, Time Thief Redoer, Danger!? Tsuchinoko?, and Orcustrated Einsatz face-up on his field, and The Phantom Knights’ Rank-Up-Magic Launch face-down. Barwicki activated Pot of Extravagance and banished 6 random cards from his Extra Deck face-down to draw 2 cards. Next, he activated Pot of Duality to add Rivalry of Warlords from the top of his Deck to his hand. He Set 3 cards to his back row and then ended his turn. Kenny drew Thunder Dragondark and then Barwicki flipped Rivalry in the Standby Phase. Kenny Chained the effect of Redoer by detaching both Xyz Materials from it, and Barwicki Chained another Rivalry. Kenny kept Rusty Bardiche on his field and sent his other monsters to the Graveyard. He returned a Rivalry to the top of Barwicki’s Deck with the Time Thief’s effect. Next, Kenny activated Rusty Bardiche’s effect, but lost out to Ash Blossom & Joyous Spring. Kenny discarded a Thunder Dragondark to add another copy of it from his Deck to his hand and then Tributed Rusty Bardiche to Set a monster. He paid 3000 Life Points to Special Summon The Ascended of Thunder next, and attacked directly to drop Barwicki down to 4800 Life Points. In Main Phase 2, Kenny Tributed The Ascended of Thunder to Special Summon Thunder Dragon Colossus from his Extra Deck. Barwicki Set 2 cards to his back row and passed his turn. Kenny Flip Summoned Thunder Dragondark and then paid another 3000 Life Points to Special Summon another copy of The Ascended of Thunder. 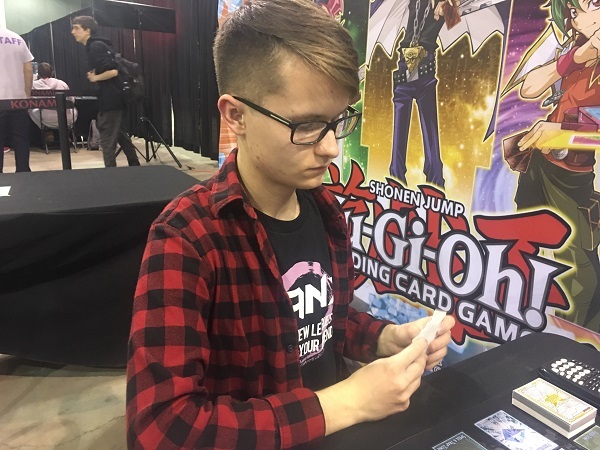 At the start of his Battle Phase, Barwicki flipped Altergeist Manifestation to Special Summon Altergeist Multifaker from his Graveyard and used Multifaker’s effect to Special Summon Altergeist Silquitous from his Deck. Kenny attacked Silquitous with Thunder Dragondark, and Barwicki used Silquitous’s effect to return Multifaker to his hand and return Colossus to the Extra Deck. Thunder Dragondark attacked and destroyed Silquitous, allowing Barwicki to return Manifestation to his hand. The Ascended of Thunder attacked directly, dropping Barwicki down to 2100 Life Points. Barwicki activated Rivalry and then Special Summoned Multifaker. He used its effect to Special Summon Altergeist Meluseek and then combined his 2 monsters to Link Summon Altergeist Hexstia. He used Meluseek’s effect to add Altergeist Marionetter to his hand and then Normal Summoned it, using its effect to Set Altergeist Protocol from his Deck. He then swapped the Marionetter with Meluseek by using Marionetter’s effect and attacked directly with Meluseek, using its effect to send The Ascended of Thunder to the Graveyard. In Main Phase 2, Barwicki Set a card to his back row and passed his turn. Kenny drew a card and conceded, completely devastated by Barwicki’s Rivalry of Warlords earlier in the Duel. 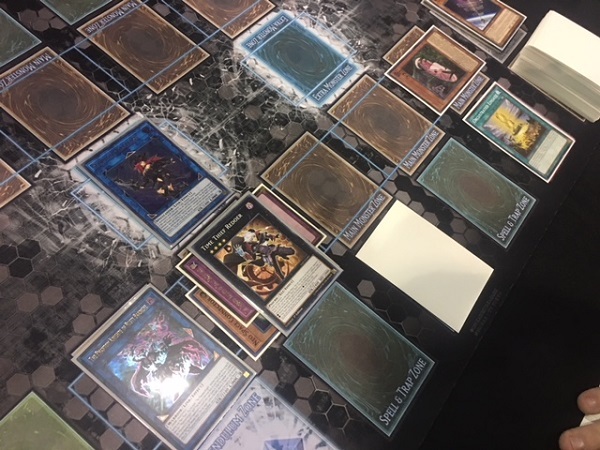 Despite a fairly strong start for Robert Kenny, Christopher Barwicki takes the first victory with his Altergeist Deck! Kenny opened up with Neo Space Connector, Danger!? Tsuchinoko?, Trickstar Light Stage, and 2 copies of Called by the Grave. 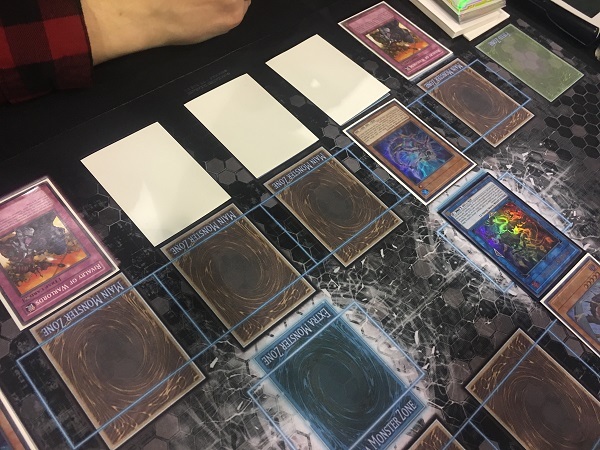 He Summoned Neo Space Connector and activated its effect, but lost out when Barwicki activated Infinite Impermanence from his hand to negate it. Kenny activated Trickstar Light Stage next, and used its effect to add Trickstar Candina from his Deck to his hand. Kenny used the effect of Tsuchinoko next, and discarded Candina from his hand at random to Special Summon Tsuchinoko and draw Danger!? Jackalope?. He used the Jackalope’s effect and randomly discarded it, allowing him to Special Summon Danger! Nessie! from his Deck. He used Tsuchinoko and Connector as Link Materials to Summon Knightmare Cerberus and then used Cerberus as a Link Material to Link Summon Knightmare Mermaid. He discarded Called by the Grave to activate Mermaid’s effect, but Kenny activated the effect of PSY-Framegear Gamma in his hand! He Special Summoned it along with a PSY-Frame Driver from his Deck, negated the activation of the Mermaid’s effect, and destroyed the Mermaid. He banished both monsters in the End Phase. Barwicki Set 4 cards to his back row and passed. Kenny drew a card and Barwicki flipped Rivalry. He switched Nessie into Attack Position and used Light Stage’s effect to target a face-down Altergeist Protocol, which Barwicki Chained. Next, Nessie attacked directly. Kenny Set a card face-down, and in the End Phase Barwicki flipped Personal Spoofing. He tried to use its effect by shuffling his Protocol back into his Deck, but lost out on the search to Kenny’s Ash Blossom & Joyous Spring. Barwicki drew a card and Set it to his back row. Kenny drew a card and then used Light Stage to target Barwicki’s newly Set Infinite Impermanence, which he Chained targeting Nessie. Barwicki drew a card and then activated Rivalry. He then activated the effect of Multifaker in his hand to Special Summon it and Special Summon Meluseek from his Deck. He sent his 2 monsters to the Graveyard to Link Summon Hexstia and then tried to use Meluseek’s effect, but lost out to Called by the Grave. He attacked Nessie with Hexstia next, destroying his own Hexstia in battle, and then used Hexstia’s effect to add Marionetter from his Deck to his hand. He Normal Summoned the Marionetter and used its effect to Set Protocol from his Deck. Next, he used Marionetter’s effect to send the Marionetter to the Graveyard and replace it with a Hexstia on his field. Kenny drew Phantom Knights’ Fog Blade and then used Light Stage targeting Protocol. Barwicki Chained it, and then Chained Spoofing to return Protocol to his Deck and search for Multifaker. He Special Summoned Multifaker and Special Summoned Silquitous to his field along with it. Nessie attacked and destroyed Multifaker, and Kenny Set Fog Blade to his back row. 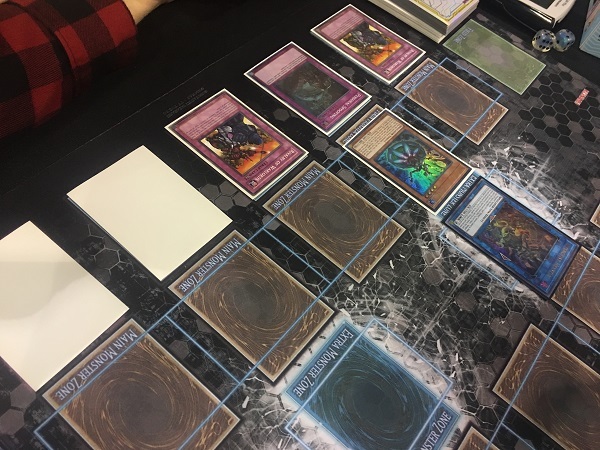 Barwicki sent his 2 monsters to the Graveyard to Link Summon another Hexstia and then used the effect of the Hexstia in the Graveyard to add Marionetter from his Deck to his hand. He Summoned Marionetter Linked to Hexstia and used Marionetter’s effect to Set Protocol from his Deck. With Hexstia’s ATK increased because it was linked to Marionetter, Barwicki attacked Nessie with Hexstia to destroy it. Marionetter attacked directly next, dropping Kenny down to 4900 Life Points. In Main Phase 2, Barwicki tried to use Marionetter’s effect, but Kenny flipped Fog Blade to negate its effect. Barwicki Set a card to his back row before passing. Kenny used the effect of Light Stage to target Barwicki’s newly Set card and then activated the effect of the Tsuchinoko in his hand. He randomly discarded Orcust Cymbal Skeleton from his hand and Special Summoned Tsuchinoko. Upon drawing Orcust Knightmare with the effect of Tsuchinoko, Kenny conceded, unable to mount a comeback. 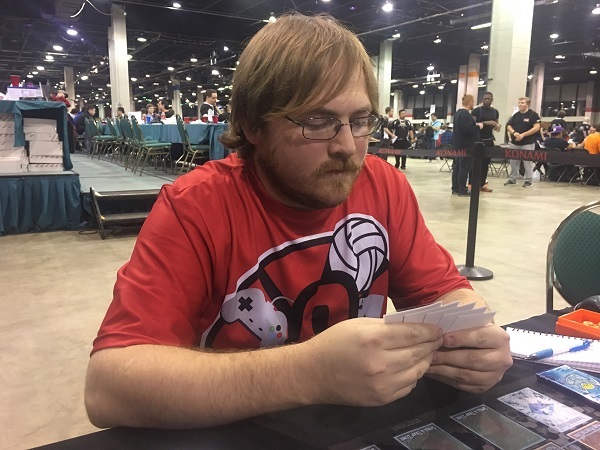 Christopher Barwicki is moving on with a 7-1 record using his Altergeist Deck!